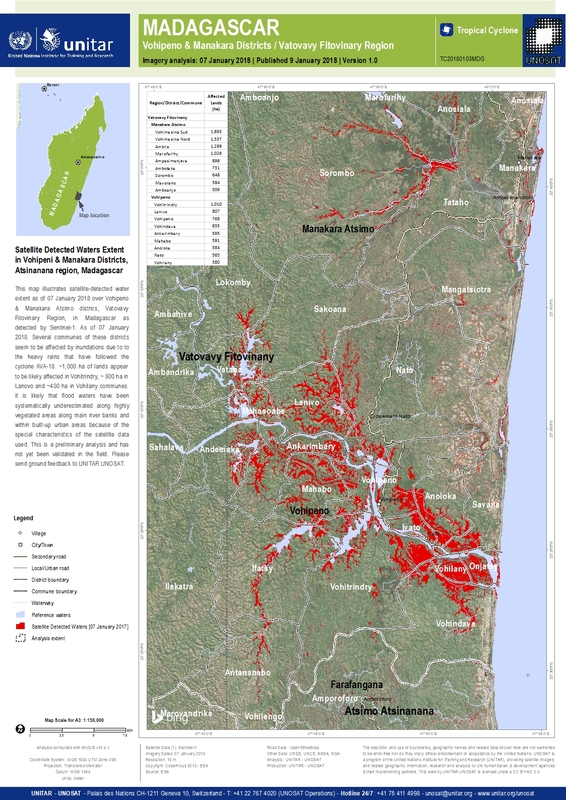 This map illustrates satellite-detected water extent as of 07 January 2018 over Vohipeno & Manakara Atsimo districs, Vatovavy Fitovinary Region, in Madagascar as detected by Sentinel-1. As of 07 January 2018. Several communes of these districts seem to be affected by inundations due to to the heavy rains that have followed the cyclone AVA-18. ~1,000 ha of lands appear to be likely affected in Vohitrindry, ~ 800 ha in Lanovo and ~400 ha in Vohilany communes. It is likely that flood waters have been systematically underestimated along highly vegetated areas along main river banks and within built-up urban areas because of the special characteristics of the satellite data used. This is a preliminary analysis and has not yet been validated in the field. Please send ground feedback to UNITAR UNOSAT.